Since I was a teen when Diane Cottler took her son Dan and I to my first Chinese Restaurant, I have preferred Oolong Tea to any other. There is a different taste, more woody, more body, not quite as sweet as the common teas that are drank in the United States as well as elsewhere. This tea is also not quite as common as the mass market tea. Having gone through some times where it was difficult to find this tea in supermarkets and tea shops at a reasonable price, it's been a habit to pick it up in bulk when it's found. This weekend was the great tea quest. Having gone to a shop that had this tea down in North Miami Beach we originally got one tin of this. 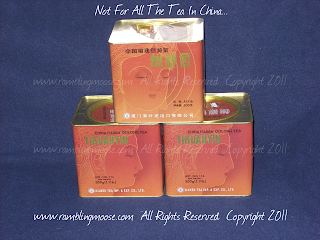 The tea was in large tins, 500 grams, or around 18 ounces for just under $13. You'll pay that for 2 ounces at that posh and overpriced tea shop in the mall, or a little less at a supermarket. The picture is deceptive, these tins are rather large, and the calligraphy and the art on them is appreciated. There are a couple of the tins around from prior purchases because they're too nice to recycle. 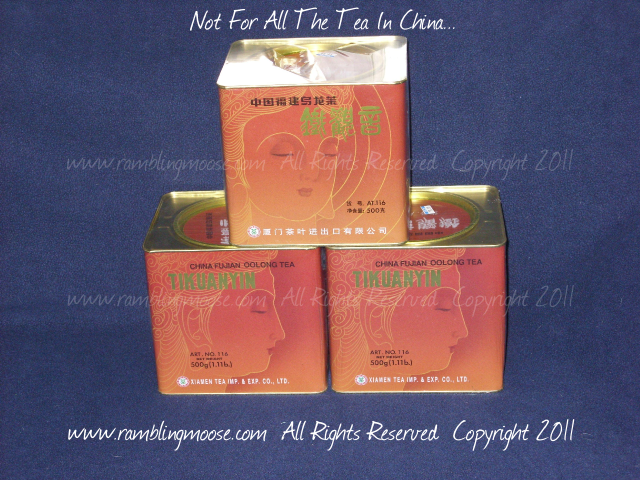 This particular tea seems to be something of a specialty item within a specialty item. Tikuanyin Oolong has it's own processing methods and it's own fan base. I seem to have stumbled onto something really good and drinking it for a common iced tea. Starting on our way back from lunch at Ikea on Saturday, we turned off on the wrong road and headed North to find the orignal shop in Oakland Park. Unfortunately we were about 4 miles west of Oakland Park on the wrong side of the turnpike in "OTP" land - Over TurnPike land - or Out There in East Naples. After laughing at our wrong turns and finding the first shop, we went in expecting my familiar brown tins but these Beautiful Brown Tins were nowhere to be found. Since these places are almost always What You See Is What You Get, we left scratching our heads. I insisted that it wasn't necessary to drive down to Hollywood or North Miami Beach "just for tea" and I'd do it on my own on Monday. Not to be inconvenienced, I was told we're going to Hollywood and that's that. Not one of my favorite trips, mind you, since driving to Hollywood means going through some of the more questionable areas of Broward County. The signs of a bad neighborhood on SR7/US441 were around us and it would have even been obvious to a tourist that it wasn't exactly somewhere to be after dark. As we descended into "Police Women Of Broward County" areas, we arrived at shop 2. They were usually predictable about their supplies, but didn't have any. Shop 3 was in the same center, and walking past the homeless guy sitting out front we found they were empty too. Even he didn't have my tea, and we figured out that the shops in Broward seem to have changed their suppliers. Getting back into the car, we realized we were going to go to North Miami Beach, and the crowds on 163rd Street. That meant going through more of those "Police Women" areas, and more stop and go traffic. Checking the GPS on the phone showed that the most likely road wasn't 163rd, but 167th street and since it wasn't on my phone, I had to go on faith that we knew where we were going. Not realizing that 167th became 163rd, we were going on hope that we were going the right way, but it was eventually found. That particular store had a stack of 8 of the tins, and instead of buying them all up, we came home with the three. The trip ended up taking all afternoon. By the time we got to shop 4 and found it, there was a constant mantra of "We Don't Have To Go All The Way To Freaking Miami For Tea" and "Oh No, You Need Your Tea". An interesting way to get to see parts of South Florida that the tourists don't normally get to see, unless they're hunting for tea.